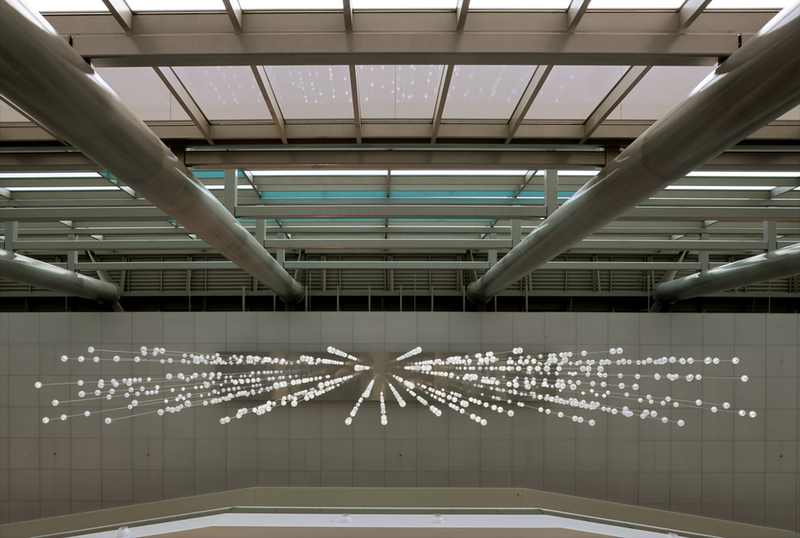 Dissonant Cloud is a permanent public art installation located in the main entry atrium of the Orlando Event Center. The artwork was conceived to possess multiple personalities that would be reflective of the diverse activities within the center. These personalities range from passive non-electrified responses to sunlight that cause glistening ephemeral shimmers of light within each sphere, to active electronic dissonance of moving color and pattern created through contemporary technology. 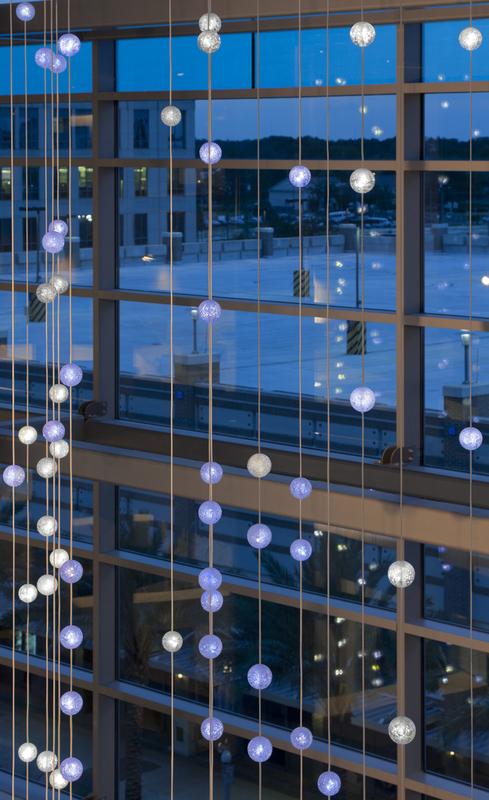 The luminous sculpture is centrally positioned within the five story glazed lobby to maximize primary sight lines from the exterior, interior atrium and adjacent concourses. The tiered concourse levels give viewers opportunity for near and distant proximities to the work. Reflections in the façade and guardrail glazing expand the sculptures scale and experience for viewers. Many iterative full scale studies were made to evaluate proportion, materiality, finish, specularity and visual play of electric and natural light. 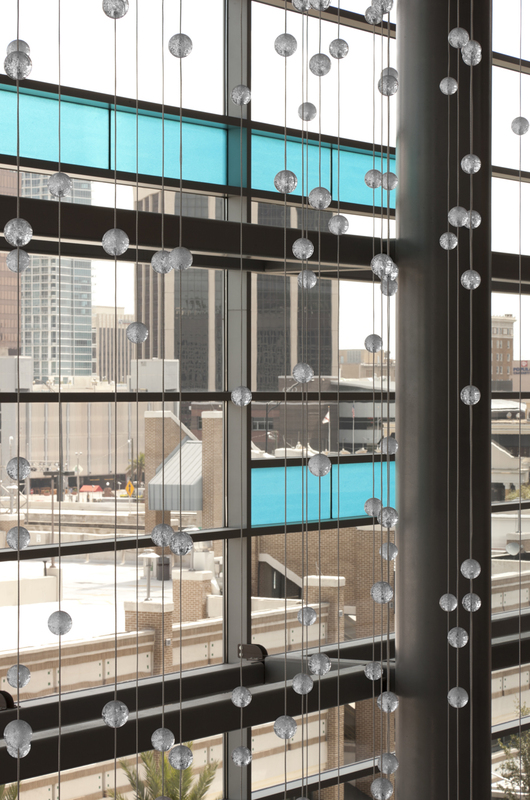 The final sphere design contains internal air bubbles that play with light similarly to cut crystal facets. The sculpture is 44’ tall, 42’ wide and 6’ deep, is comprised of 60 strands (made up of 7 miles of electrical wiring and data links) that support 730 individually addressed spheres each of which contains 6 tri-colored LED light nodes that can be individually programmed to display more than 16 million colors. A group of pre-programmed scenes were created by the artist team to be used at a range of events. However, the owner is encouraged to create new scenes as well as engage local artists and arts organizations to introduce new programming, resulting in new and varied personalities to this adaptable civic artwork.